My latest Slate column is up, and the subject is the informal language of the road (and yes I know about the Australian ‘waggling pinkie,’ but for editing reasons, etc., it got cut). For space reasons I also didn’t get into the whole gamut of bicyclist/motorcyclist/pedestrian gestures — though I remember at one Brooklyn crosswalk I was turning right and a person about to enter the crosswalk did an elaborate bow/sweep of the hand to urge me through, to which my reply was to try to apologize for violating the right of way. Then there was a secondary round of strange gestures in response to the first. And then, of course, the driver behind me honked. Comments Off on The Bird, the Wave, and the Shaka. Click here to leave a comment. 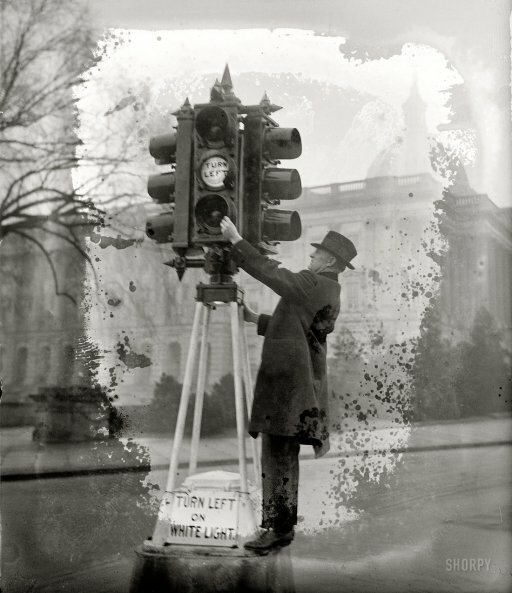 In the book I discuss special “Sabbath timing” patterns for traffic signals in Los Angeles. The Virginia Department of Transportation will alter traffic signals at 14 shopping centers in Northern Virginia to accommodate the increase in shoppers on Black Friday and during the holiday season. Using traffic data from previous years, VDOT will implement time- and location-specific signal timing at 188 intersections. The timing changes are intended to minimize backups near shopping centers and maximize traffic flow around them. Comments Off on Shopping Timing. Click here to leave a comment. Comments Off on Left on White. Click here to leave a comment. A problem with traffic signals you’ve probably not thought much about: The new LED lights (which consume less energy) tend not to melt the obscuring snow that accumulates on them. Comments Off on Problems With Signalized Intersections, Continued. Click here to leave a comment. Others wanted the yellow light shown before the signal was changing to red and before it was changing from red back to green (which one sees today in Denmark, among other places, but nowhere in North America). 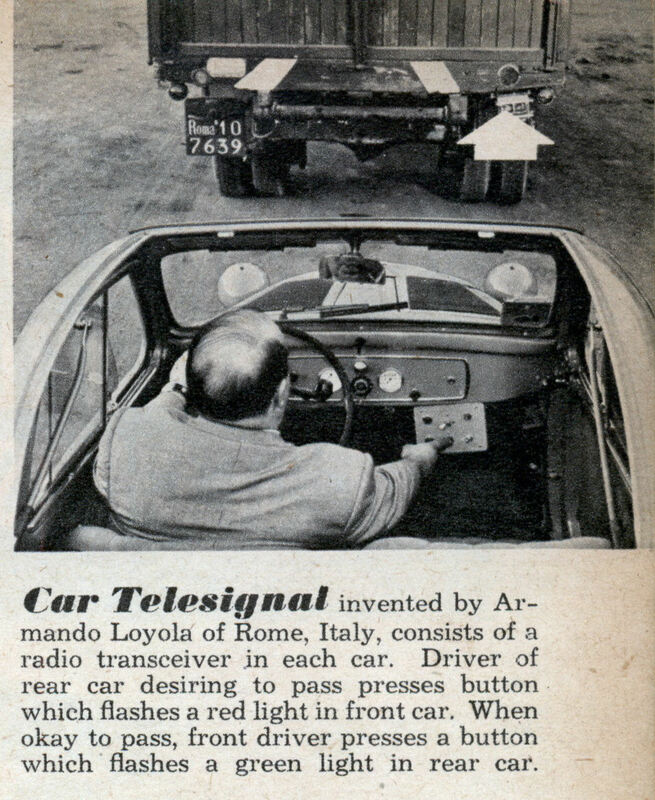 I distinctly remember passing through signals of this type on arterial streets in Chicago between 1977 – 1983. They were mostly located west of the L tracks on arterial streets like Belmont, Armitage, Fullerton, Devon, and Ashland. I’ve seen international studies on the potential problems with the red-amber-green phase, but haven’t really heard or read an account of why these phases vanished in the U.S. (though I’m sure the information is out there, in some back issue of the ITE Journal). I can imagine there are pedestrian issues, not to mention intersection clearance issues. And given that hardly anyone drives a manual shift in the U.S., one of the perceived virtues of that system is now largely lost here, like an old piece of slang no one uses anymore. Comments Off on Red Yellow Green. Click here to leave a comment. I’m fascinated by all the curious would-be traffic safety devices lingering in dusty patent offices around the world, a collection of better brake lights, more evocative horns, elaborate safety harnesses, etc., that have never made it onto the road (for better or worse). I came across the one above, recently, via Modern Mechanix. It’s evidently meant as a way to make passing other vehicles on two-lane roads a safer proposition. 1.) As with all new signals, there is the problem that many drivers don’t use the existing signals they have. 2.) What if a driver is distracted or doesn’t care to respond to your request for passing clearance? 3.) Are we really to trust the driver ahead to tell us if it’s safe to pass? 4.) Does the driver ahead want to be held liable if it turned out it wasn’t safe to pass? Comments Off on A Passing Fancy. Click here to leave a comment. From the Times of London, a story that seems “ripped from the pages” of Traffic. 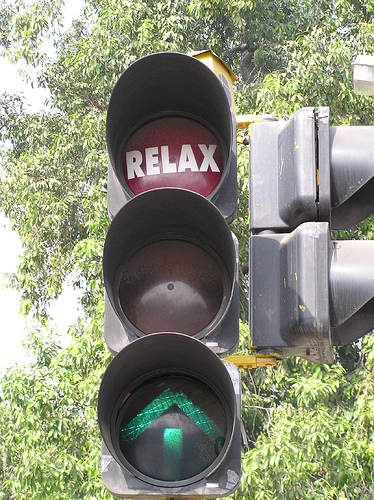 What would happen if traffic lights were suddenly switched off? Would there be gridlock or would the queues of frustrated drivers miraculously disappear? People in London are about to find out the answer in Britain’s first test of the theory that removing lights will cure congestion. For six months, lights at up to seven junctions in Ealing will be concealed by bags and drivers will be left to negotiate their way across by establishing eye contact with pedestrians and other motorists. Of course, careful attention will have to paid to safety results, particularly with pedestrians (the piece refers to some new mid-block crossings but one has to entertain the idea that these treatments may reduce pedestrian’s perception of safety and thus, potentially, one’s inclination to walk). The one day of outage could have represented a novelty effect. But the interesting thing about these novel treatments is that they are often done with much more care and concern than the standard “out of the book” approach that is applied automatically. 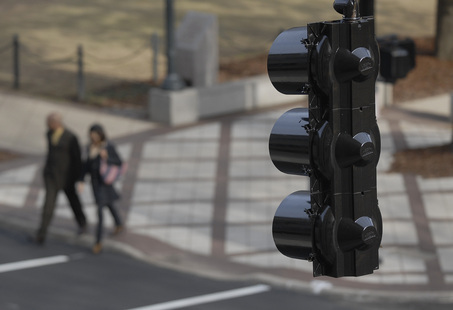 Comments Off on Bad News for Traffic Signal Manufacturers. Click here to leave a comment. One of my personal urban pet peeves is that the traffic signals on a street like New York’s Fifth Avenue, on which a majority of users are pedestrians, seemed timed in such a way to interfere as much as possible with smooth ambulatory progress. Seriously, I feel like I have to stop at every single light on Fifth. From the invaluable Streetfilms comes a look at what would happen if a street like Valencia in San Francisco had its signals timed such that cyclists had a green wave. What about cars, you ask? Isn’t that anti-car-ism? Well, actually, as San Francisco Streetsblog points out: “Recently, the San Francisco Municipal Transportation Agency (MTA) found that during peak commute times vehicles run more efficiently when signals are timed at the speeds they actually travel during congestion — 12 to 15 mph — rather than the current 25 mph.” Not to mention that cyclist signal compliance rates will inevitably rise. On streets to which you’re trying to attract cycles, why not offer the carrot instead of merely the stick? Synchronization, in a grid city, has its natural limits but it’s certainly worth favoring certain modes on particular streets. I often find some of the most hazardous urban driving behavior to be people accelerating between lights, or emerging from a pack of congestion. The question is how to get drivers to stick to speeds that are lower overall, but actually promote smoother, more fuel-efficient driving. ISA (intelligent speed adaptation) is probably the most far-reaching tool, but in some ways a political non-starter in the U.S. (for now, at least). I suspect that merely telling drivers through signage that the only way to get a row of greens is to drive 15 or 20 mph will somehow not work (the average driver is an incredibly opportunistic, short-range planner, only concerned with getting to the next red light as fast as possible). Comments Off on Green Wave Blues. Click here to leave a comment. Then I looked at the date of the article: 1938. I’m not sure what Bayonne replaced its lights with —anyone know? — perhaps early traffic circles. “No scientist has explained why. But last week, in the Journal of the American Medical Association, Cincinnati Physician Howard D. Fabing examined the behavior of the average motorist, found that traffic lights caused conditioned reflexes which made him as dithery as one of Russian Physiologist I.P. Pavlov’s famous third-degreed dogs. Comments Off on Traffic Light Neurosis. Click here to leave a comment. Do you remember how, in the early days of the personal computer, you would constantly hear of all the amazing things you could do with it, such wondrous tasks as “balancing your checkbook”? In other words, you were being asked to spend a significant sum to do something that would more easily and efficiently be done on the cheapest calculator. In other words, the traffic lights send a signal to the approaching Audi, which then gives the driver an approach speed that will allow them to fluidly sail through the intersection, avoiding fuel-wasting stops and starts. I’m skeptical of this for a few reasons. The first is that my 2001 Volvo already happens to have this technology. What’s more, it cost me nothing to add it. What’s the wonder device? My brain. Partially because I like to drive in a way that maximizes fuel efficiency, and partially because I don’t get much of a kick at idling at traffic lights, I tend to slow down ahead of time if I see I’m approaching an intersection whose traffic signal is red (conversely, and who doesn’t do this, if I see the green is “fading,” based on flashing ped signals, I will speed up, within reason). I’m constantly astounded how often, in New York City, drivers — particularly taxi drivers — often blaze past me, only to find themselves lingering at the light (maybe it’s because we’re wired to focus on short-term gains). Then, even though I was going slower to begin with, but because I haven’t had to make a complete stop, I typically drive right past them. Avoiding unnecessary stopping and acceleration is one of the main precepts of “eco-driving” or “hyper-miling,” but it’s really just a function of being an alert, thinking driver (and some studies have noted the connection between fuel efficient driving and safe driving). This leads me to my second big complaint with Audi’s system. Not only is it asking the driver to take their eyes off the road to look at a gauge to get information they could more or less discern by looking ahead, at the road, it presumably wouldn’t know things like the length of the queue of vehicles waiting at the light (unless, perhaps, they were all Audis) — so any stated approach speed might be completely inappropriate given the necessary start-up and clearance time of all the other vehicles. The simple fact of being given an approach speed for the intersection might induce some kind of “automatic” thinking, in which a driver may focus on maintaining the correct speed as their key task rather scanning the intersection (where close to half of all crashes occur) — in the way drivers can focus too much on the light itself rather than, say, vehicles that haven’t cleared the intersection for some reason. Of course, being given the correct approach speed for hitting the green isn’t much help if you’re asked to approach at five miles an hour because the light is backed up with traffic. That’s why I suspect the money (not sure what Audi’s communicative lights would cost) would be better spent on lights that could talk to each other. Which we already have, of course, in some places — but even these need human help once in a while. 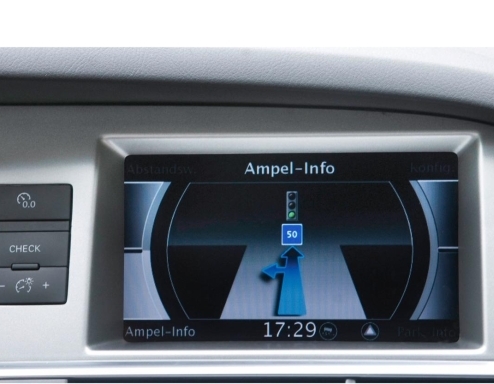 Comments Off on Audi’s Dumb New Smart Technology. Click here to leave a comment. This comparison intrigued me for several reasons. The first is that one rarely sees “traffic time” compared to other moments of time from everyday life. What other mundane acts of life could theoretically be performed in the time stuck at the lights? The second is that very fact that we wouldn’t think of the time we spend at a light as being equal to waiting for tea; this in itself reminded me of studies I had seen in which people underestimated the amount of time it would take to drive somewhere, and overestimated the amount of time it would take by another mode. Traffic is a very time-skewing activity in general. When we’re moving along at a good clip, we tend not to notice any time signals (except for “on the hour” announcements on radio and the like); when we’re stuck in heavy traffic, aware of every vehicle passing us, we’re more aware to minor moments of progress and change and thus, as Klein argues, these trivial things add up to “a perceived time that seems much longer than what our watches tell us.” Which is why watched kettles, of course, take longer to boil. Comments Off on Of Tea Kettles and Traffic Lights. Click here to leave a comment. “Although the behaviour of individuals is often simple, the collective patterns to which it leads can be counter-intuitive, making common sense a faulty guide to what might happen. 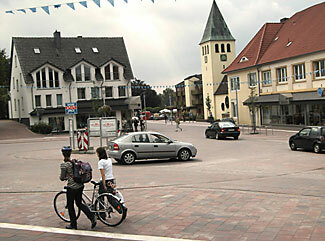 For example, it is generally true that traffic jams become more likely as traffic density increases. It’s not always the case, though, as Helbing’s group has shown. Another interesting strand in the piece is the notion that allowing traffic lights to control themselves would improve traffic flow. 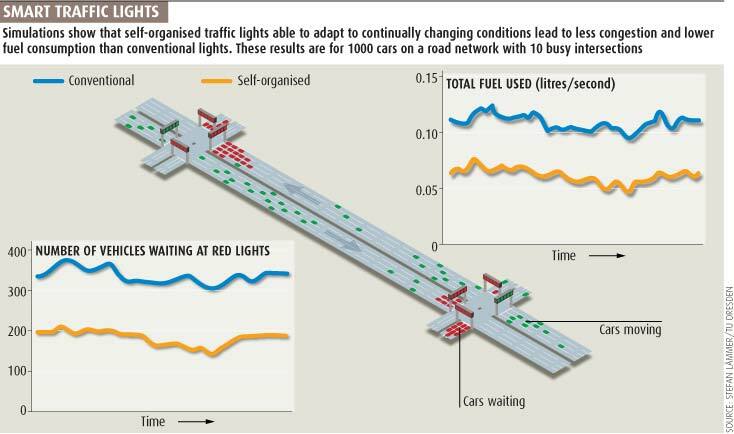 Instead of set timing patterns or even merely “synchronization,” the lights judge conditions for themselves and make constant adjustments (this is essentially the high-tech version of Hans Monderman’s “bottom-up” traffic scheme in the Netherlands). This is one of the next frontiers of traffic, and I’ve had described to me fascinating systems employing “genetic algorithms” for things ramp meter lights — the ramp meters would in essence keep learning over generations of traffic flow, evolving into smarter systems. Comments Off on Self-Organized Traffic Flow. Click here to leave a comment. 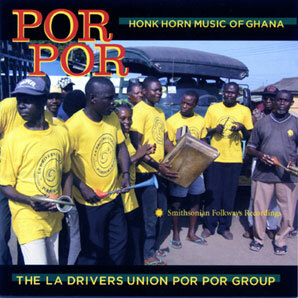 Like Aaron Naparstek, I don’t much like car horns. Particularly in New York, where they seem to be used — almost always inappropriately — at a higher frequency than comparatively honkless cities like Los Angeles. Comments Off on The Men With the Horns. Click here to leave a comment.